Our 12 days of Christmas menu guides ends with a new twist on an old favorite for me, chicken parmigiana, but made in a low-salt, low-fat way. 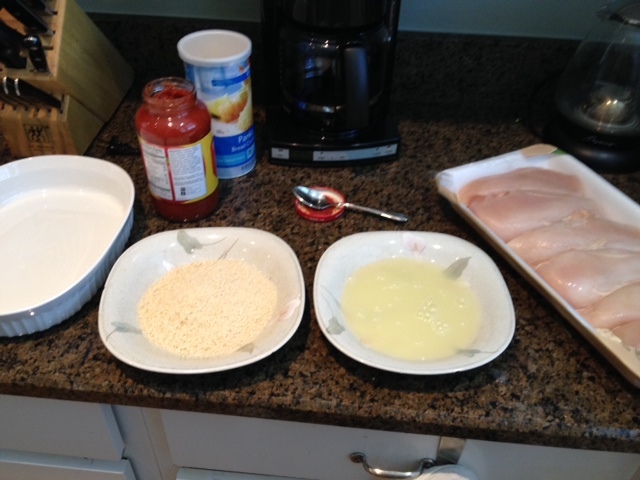 Start with fresh chicken breasts, egg whites, panko breadcrumbs and no-salt-added marinara sauce. Use panko breadcrumbs to cut salt, low- and no-fat cheese, and egg whites rather than whole eggs to coat the chicken breasts before breading. Bake rather than fry and you’re on your way. I hope you’ve enjoyed these menus for the holiday season. Comments have been great for them and viewership has been solid, so I hope they’ve helped people get through the holiday food season without going off their low-salt, low-fat, low-sugar diets, too much. Keep coming back here all year for more great recipes, news about ingredients and other helpful, healthy shopping tips. Canned red sauce has a ton of sodium in it. What do you suggest as substitue? I was thinking of mixing Sugar Twin (brown) with teraiki sauce. But wondering if you have a low salt, low sugar (sugar twin brown maybe) recipie for chicken marinade?